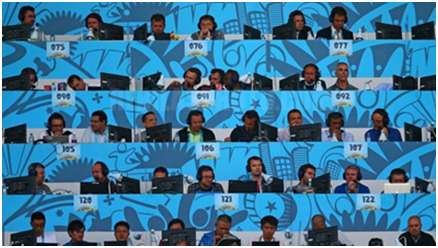 At all large sports events, rights holding broadcasters in their commentary positions, as well as journalist at written press desks are provided with TV monitors. They can switch between different channels. The channels requirements for these TVs are completely different from venue system, a low delay, separate and temporary system to be installed in the media tribune area. The FIFA World Cup, often simply called the World Cup, is an international association football competition contested by the senior men's national teams of the members of Fédération Internationale de Football Association (FIFA) every four years. 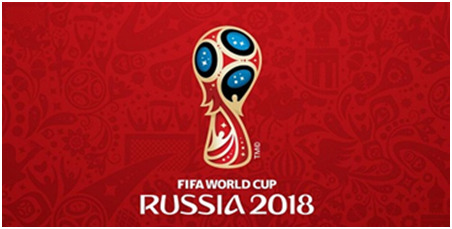 In 2018, the FIFA World Cup will be held in Russia from 14 June to 15 July. The signal latency of the Media Tribune system FIFA asked in the World Cup 2018, has to be less than 300ms with mandatory technical requirements, which makes highly strict limits for encoders. Through the unremitting efforts of R&D and repeated internal testing, Sumavision successfully launched super-low-delay video encoding solution. The EMR encoder delay is less than 50ms, which has reached the industry top level, proofing the strong R&D strength of Sumavision in the video processing field. The official test result shows the overall delay from encoder to all-in-one TV is less than 260ms, which completely meets FIFA’s requirements. So far, the encoding delay, distribution concepts and model of tribune monitors have been tested and confirmed by the FIFA Confederations Cup, which is expected to boost Russia's World Cup live broadcast. In the past 5 years, the market share of Sumavision in Russia has been reached to compound growth rate of over 60%. So far, Sumavision hardware, intelligent terminal, access network solutions and other products have been widely used in Russian TOP operators, providing ultimate DTV experience for users in Moscow and other cities. After 17 years of technological innovation and independent development, Sumavision has already had capacity to provide end-to-end turnkey solution in DTV industry. Up to now, Sumavision has provided professional services for more than 110 countries and regions around the world. With Beijing as the headquarter, Sumavision has established eight marketing centers, 39 offices in the United States, Russia, India, Philippines, etc. Sumavision is willing to provide better solutions and professional after-sales service to extend the enterprise's vision“For Better Digital Life” to the world.